Milutin Tesla was born in Raduc, county Medak, Lika, on February 19 (OS), 1819. The Serbs came to Raduc from around Knin in the 1690s, having arrived there from western Serbia, via Hercegovina. The name Tesla denotes either a trade, as tesla is Serbian for adze - a small axe with a blade at right angles to the handle - or a physical characteristic, such as protruding teeth, prevalent in the Tesla family. The name Tesla is also found in Ukraine. In Roman times, there was a place near Raduc, called Tesleum. Milutin's father, Nikola, was born in 1789, and during the Napoleonic wars, when Krajina was part of the newly-formed French Province of Illyricum, he was a sergeant in the French army. He married Ana Kalinic, from the family of Colonel Kalinic, who is mentioned in the Raduc military records for 1735 and 1754; sometime after 1815, and the return of the old Austrian order, he moved to Gospic. Nikola and Ana had two sons: Milutin and Josif, and three daughters: Stanka, Janja, and one whose name has not been remembered. Milutin attended the German-language public school; then, together with his brother, went to the Military Officers' Training School; but the military profession, with its discipline and drills, did not suit him and, following a reprimand for not keeping his brass buttons bright enough, he left, and enrolled into the Orthodox Seminary in Plaski, completing his studies in 1845, as the foremost student in his class. In 1847, Milutin married Djuka Mandic, the 25-year old daughter of priest Nikola Mandic, from Gracac, and was ordained by Bishop Evgenije Jovanovic, who appointed him, first, to be in charge of the church in Stikad, and from there, on April 30, 1847, sent him to Senj on the Adriatic coast. The young pastor was expected to strengthen the congregation of some forty households, and represent Serbs before the "foreign and Catholic persons." Milutin was paid 200 forints per year, and an additional 40 forints toward a lodging, but these sums were barely enough to make ends meet. Milutin was "a head taller" than his congregation, of pale, serious visage, high cheek bones, sparse beard, and a talented speaker and preacher. For his sermon "On Labour" he was awarded the Red Sash of the Bishop. He was a fine penman, and wrote many letters, some of which have been preserved. 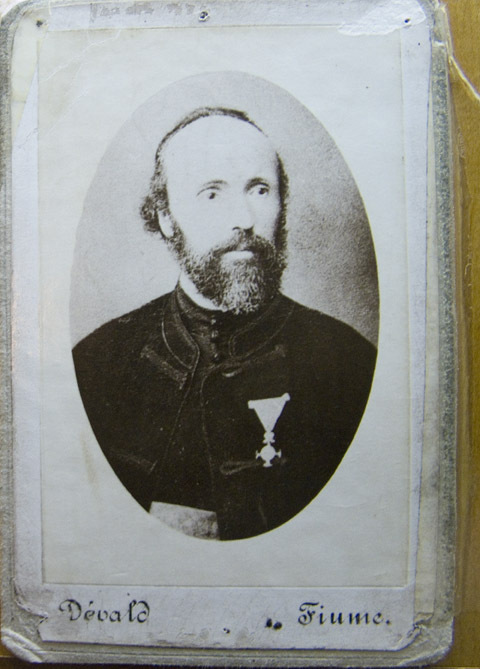 On July 20, 1848, he wrote to the local military commander, Major Froschmeier von Scheibenoch, requesting that he allow Serb soldiers to attend the Orthodox Church services on Sundays: his request was transmitted to the Governor of Croatia in Zagreb for a final decision, and the Commander continued to send all soldiers to the obligatory Roman Catholic mass - "holding our clergy as nothing," noted Milutin Tesla. Poor material circumstances were compounded by ill health. "It is impossible to preserve one's health here...", he writes to the Bishop. In mid-August 1850, he was so ill, that his brother-in-law, Toma Mandic, came to Senj, to perform his pastoral duties, and stayed for many months in the "stony church perched on a steep cliff." On Easter Monday, 1852, Milutin responds on the back of the received letter, and adds a post script, "Forgive me, I have no paper." On July 31, of the same year, he writes, "Justice sits on the throne, and law courts are, God forbid, as if we were under the Ottoman Porte..." But, "By God! Nothing is as sacred to me as my church and my forefathers' law and custom, and nothing so precious as liberty, well-being and advancement of my people and my brothers, and for these two, the church and the people, wherever I am, I'll be ready to lay down my life." In mid-September, 1852, after nearly five-and-a-half years in Senj, Milutin and Djuka put their three small children, and few possessions, in the ox-cart for the 75 kilometre trek over the Dinaric mountains, back to Lika, to their new destination - the pastorage of St. Peter and Paul in Smiljan - the place of sweet basils. The white church, at the foot of the Bogdanic mountain, beside the Vaganac running brook, was built in 1765, on the foundations of an older church. Beside the church, there was a fine wooden house for the family. The great educator and writer, Dositej Obradovic, had stayed in it twice, and Vuk Karadzic once, in 1838. Smiljan was a large parish and congregation, the priest's plot of land plentiful and fertile, the Tesla and Mandic extended families were close. Milutin's health improved, he subscribed to publications, and began to write articles for the Serbian Diary of Novi Sad, Srbobran in Zagreb, Serbo-Dalmatian magazine in Zadar, signing his name, variously, as "T", "M.T. ", "Milutin Tesla, Pastor of the Orthodox Diocese of the Upper Karlovac", "Pastor in Smiljan", and more rarely, under pseudonyms, said to be Rodoljub Srbic and Rodoljub Pravicic. In 1855, in the Diary, he writes, "Lika is, according to its territory and populace, large, and is made up of only Serbs, or if you like, of Serbs and Croats, of Orthodox and Catholic faith. In Lika, there are more Serbs of Orthodox than of Roman Catholic faith." But he also notes, "Except for the clergy and merchants or tradesmen, here and there, hardly anyone knows how to sign his name in Serbian." He wanted to build a Serbian-language school in Gospic. In the Diary of March 10, 1857, he writes, "Serbs in Croatia do not have High Schools, preparatory schools, or any other public places of learning. The sons of this poor people are not able to attend distant schools... without any stipends...." But all his efforts to improve the lot of the people were met by a wall of poverty, want of learning, and foreigner's political agenda. A literate man was not reliable cannon fodder; and fodder was the role reserved for the Krajina Serbs. Milutin had a large library, consisting, not only of clerical books, but also of current belles-lettres in Serbian, Croat, German, Italian and French. He recited verses with ease, and liked to say, in good humour, that if such and such a classic were lost, he would recover it from memory! His most prized book was the 236-page Sluzbenik, printed in Venice in 1517, by Bozidar Vukovic from Podgorica, a book printer of great craftsmanship. After Milutin's death, Djuka kept the book; after her death, Nikola took it with him to New York, and had it restored; and after Nikola, the book passed into the hands of his nephew, Sava Kosanovic who, in 1950, as Yugoslavia's Ambassador to the United States, presented it to President Truman. This rare "Book of the Serbian Liturgy" is now on display in the Harry Truman's Library in Independence, Missouri. By 1859, there were five children in the Tesla family: Dane, born in 1848, Angelina in '50, Milka in '52, Nikola in '56 and Marica, born that year. "Our priest has children above all children," the Smiljan Serbs said. The first-born, Dane, in the words of his younger brother, was "gifted to an extraordinary degree." The Tesla house was a busy place. There were endless visits by parishioners, relatives, passers-by, visiting both Milutin and Djuka, who was a spinner, seamstress and embroideress of renown; blind guslars came, and stayed for days, singing heroic ballads. These were the happy years. Djuka kept the house. "On another occasion he was taking out for a drive a friend who carelessly permitted his costly fur coat to rub on the carriage wheel. My father reminded him of it saying, 'Pull in your coat, you are ruining my tire.' He had the odd habit of talking to himself and would often carry on an animated conversation and indulge in heated argument, changing the tone of his voice. A casual listener might have sworn that several people were in the room." He once asked a shephardess, "Whose cows are these?" only to be told, "Father Tesla's." Another time, Djuka was drying some newly-thrashed wheat, left it unattended, and a cow came and fed on it in part, and scattered the rest. She was upset at this waste of grain, but Milutin said, "Djuka, our cow ate our wheat." For services Milutin had rendered some Muslims, they gave him an Arab stallion. Milutin rode it when visiting more distant families. The horse was suicidal and easily panicked. On one occasion, startled by wolves, the beast threw Milutin off, and galloped home, but was smart enough to retrace his steps and bring the rescue party to meet the abandoned rider. The 15-year old Dane was in charge of grooming the horse, and one summer day, in 1863, it cost him his life. This is how Nikola described it: "This horse was responsible for my brother's injuries from which he died. I witnessed the tragic scene and although fifty-six years have elapsed since, my visual impression of it has lost none of its force...." Dane was buried in the graveyard, only steps away from the church and the house, and the life of the Tesla family would never be the same. In the face of sudden-fallen hope, and to avoid looking at that fresh grave, the family moved to Gospic, on September 1 of that year, where Milutin would be the pastor of the onion-domed Church of Great Martyr George for the next sixteen years. The seven-year old Nikola served as a bell ringer, mourning the loss of his brother, and of the green pastures and forests of Smiljan. Milutin looked after his parish work, taught the Orthodox religion in the local schools, wrote less and less, and at a relatively young age, came to be called Old Man Milovan. He was on exceptionally good terms with the local Catholic priest, Kostrencic, and not infrequently, the two pastors would attend each other's liturgy. But watching his now only son, in his timorous awkwardness, guilelessness, extraordinary sensitivity, and ambitions which looked beyond the known and the familiar and did not bode well for a rational or happy life, there was no dance in Milutin's voice. He wanted Nikola to follow a church calling, but Nikola was determined to be a professor, technician, or an electrical engineer. And there was nothing Milutin could do. Milutin Tesla would not live to see Nikola find his calling and dazzle the world with his inventions. He did not live to see a single grandchild - and there would be ten children of his three daughters - amongst them an Archimandrite, an engineer, a medical doctor, a lawyer, and an Ambassador. For in late March 1879, he fell ill from some unspecified illness, and died on April 17 (OS), aged 60 years. The next day, Milutin was given a "funeral liturgy fit for a saint", and was buried in the Jasikovac cemetery in Divoselo. When the moment of burial came, the sun came out over the leafless cemetery, as it would burst forth during the funeral service to his son, many years later. Djuka survived Milutin by thirteen years. The following anecdote is worth repeating. Some time after Milutin's death, a certain priest, Pepo Milojevic, who had wooed Djuka when they were both young, said on meeting her, "Eh, Djuka, if you'd married me, you wouldn't now be a widow." To which Djuka responded, "I would rather be Milutin Tesla's widow than Pepo Milojevic's wife." There are no surviving sermons of Milutin Tesla. His birth house in Raduc was burnt down in 1941. The Serbian villages in the "Medak pocket" were burnt down in 1993. The Church of St. George the Martyr in Gospic was demolished in 1992. The house and church in Smiljan, extensively renovated in the years after 1863, were burnt down in 1941; rebuilt in the 1980s; partially burnt down and vandalized in 1992; and now stand empty, subject to hate-filled political spinning. 590 Smiljan Serbs were massacred in 1941; and the remainder, said to be only eleven people, were ethnically cleansed in 1995. The little graveyard, where Dane was buried, is overgrown with weeds. The running brook dried up years ago. The closest living descendent of Milutin Tesla is his great-grandson, William Terbo, who is American-born. For information on Djuka Mandic, see here. 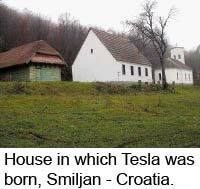 For information on the restoration of Nikola Tesla's birth house and the church in Smiljan, Lika, Croatia, see here. The world knows Serb Nikola Tesla as a pioneer of electrical power. His birth-house in Smiljani village was destroyed by Croate tanks. The crowning irony for war-battered Croatia is that hundreds of villages around Smiljan, his native town, have no electricity. "If Tesla rose from the dead, he wouldn't believe it," said Marija Batinic, 50, who lives near Smiljan and believes the heavily Serb region of central Croatia is being deprived of electricity because of ethnic discrimination. Croatia's Serbian minority, about 12 percent of the population of 4.5 million before the war, is down to 3 percent, many of them in the villages around Smiljan in central Croatia.